The Chicago Council on Global Affairs, founded in 1922 as the Chicago Council on Foreign Relations, is anxious to observe its 100th anniversary as one of the world’s most active conduits for formulating world government. 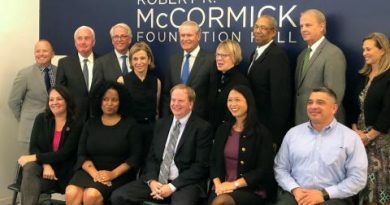 But in the meantime, this “Chatham House of the Midwest” has lit the path to 2022 with an announcement of “a major gift” to the council’s Second Century Campaign from the family of Chicago-based business mogul Lester Crown. Crown followed in the footsteps of his father, Henry, and served as president and chair of General Dynamics. The Virginia-based company remains one of the world’s largest defense contractors known for bagging huge U.S. military contracts to build some of the world’s best-known weapons systems, including the M-1 Abrams tank and the F-16 Fighting Falcon warplane. It also builds naval submarines at the renowned Groton, Connecticut ship yard. 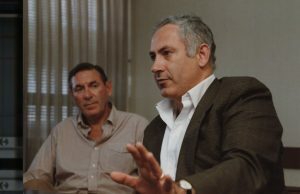 Lester Crown of General Dynamics fame (left) shown some years ago with still-current Israeli PM Benjamin Netanyahu. 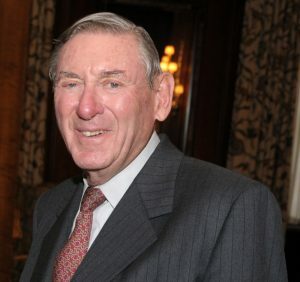 More importantly, Lester Crown, besides being a member of the deep-state Aspen Institute and the board of governors of Tel Aviv University, also is a longtime member of the infamous New York Council on Foreign Relations, founded in 1921 to coordinate the transnational elite and government for the chief purpose of privately controlling U.S. foreign policy. Ivo Daalder, president of the Chicago Council on Global Affairs (CCGA), also is a New York CFR member. And since Crown is former chairman and now chairman emeritus of the CCGA, his donation is being kept “in the family” in organizational terms. The large gift, the size of which has yet to be undisclosed, is making possible a new Lester Crown Center on U.S. Foreign Policy. Lester Crown as he looks today. Translation: This format will enhance one of the CCGA’s premier programs, the annual Forum on Global Cities, where international, national and local interests converge. The annual June forum nurtures the process of empowering cities to have their own foreign policies and diplomacy, “climate-change” policies, immigration policies (some global cities declare themselves sanctuaries to protect illegal aliens) and other avenues normally constitutionally reserved to national governments. 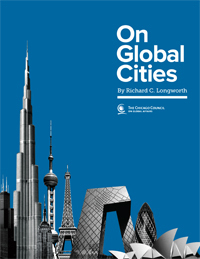 The global cities scheme involves a virtual mutiny on the part of select internationalist-oriented cities in the U.S. and abroad—to diminish the nation state and build universal (world) government from the bottom up, not just from the top down. A study by the Chicago Council on Global Cities. “Smart cities,” as part of this scheme, are to be enhanced with scores of surveillance cameras, energy-saving “smart” buildings, and expansive WiFi and mass transit systems, among other components of the pending 5-G communications upgrade. Moreover, “inclusive cities” will mandate racial and cultural integration, as well as a supposed means of balancing economic opportunities for all. But things haven’t always been so idyllic for Mr. Crown. As reported even by the sympathetic Chicago Tribune in 1986, hearing examiner from the Defense Department blocked efforts by Pentagon lawyers to revoke Crown’s top-secret security clearance because of his involvement in a bribery scandal. The ruling enabled Crown to remain on General Dynamics’ board of directors. 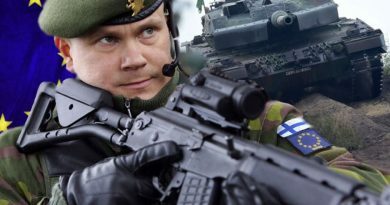 “Pentagon lawyers had sought to revoke Crown`s security clearance because Crown and General Dynamics had failed to inform the Defense Department of Crown`s involvement in the bribery of Illinois legislators,” the Tribune noted at the time. At any rate, the CCGA rather revealingly announced that with its centennial anniversary coming in 2022, the already growing and highly influential CCGA is poised for even more “transformative growth. The Second Century Campaign will allow the Council to . 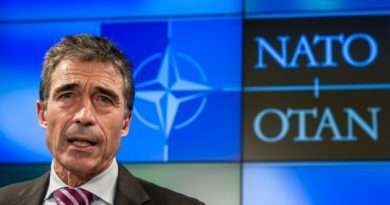 . . develop ideas that address large-scale political, cultural, and technological changes and disruptions that are driving historical shifts in the global order.” What’s left unstated is that such “disruptions” include an inconvenient nationalist-populist backlash against the one-world order envisioned by the CCGA. CHICAGO COUNCIL SEES AN ‘EMPTY THRONE’ IN U.S.